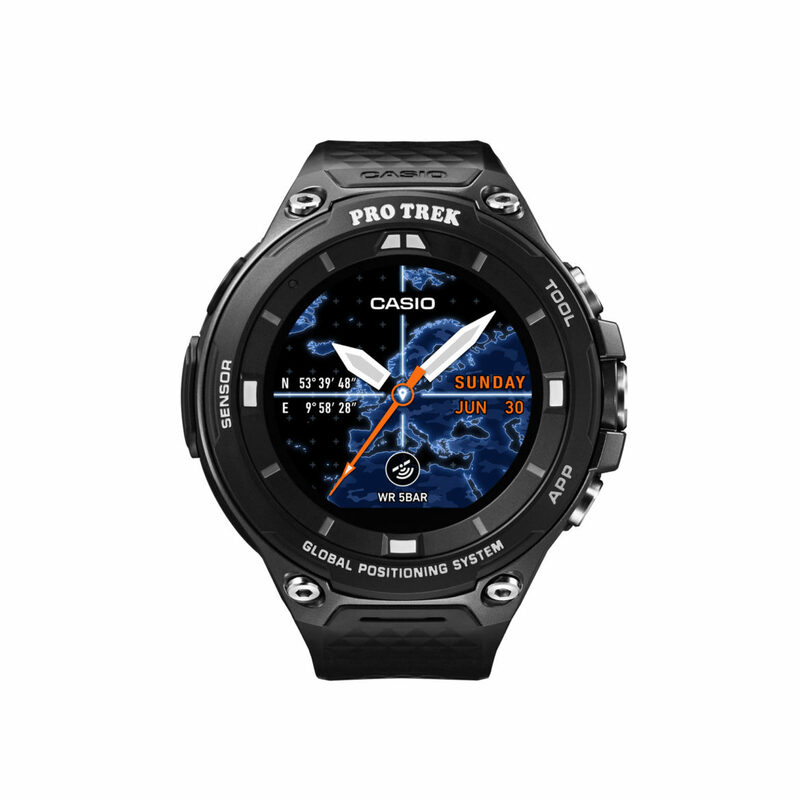 Whenever you have plans to discover the world by foot (or bike) you should buy this Casio Pro Trek Smart WSD-F20. 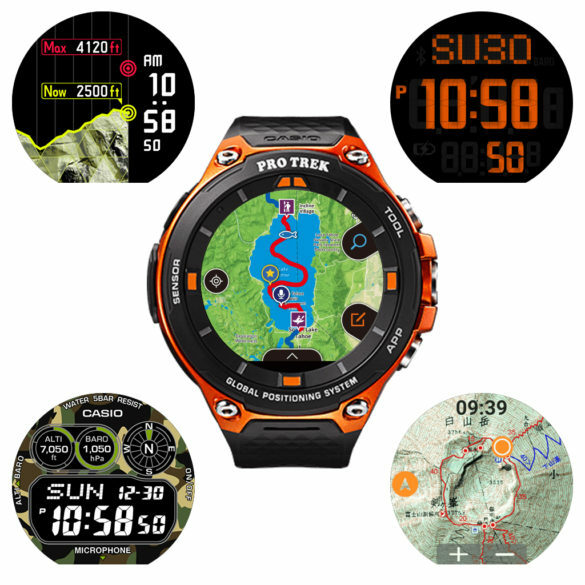 This smartwatch has so much functions, which partly comes from your smartphone, that you will be able to find your way everywhere. And you don’t have to be online all the time, it has some clever offline functionality too. The watch runs on Google’s Android Wear 2.0 which is going to be released in the beginning of 2017. Therefor the watch has less functionality if you are using an iPhone. And there are more apps available when you have an Android smartphone. Think Gmail, Google Maps, Google Voice Search (yes, it has a microphone), Google fit and weather forecasts. Operating the Casio Pro Trek Smart WSD-F20 is easy. There are three buttons: a tool button for the internal functions, a large power button and an app button. Connect the watch with Wi-Fi or Bluetooth to use apps and external functionalities. The low-power GPS ensures connection on your location when your cellphone network does not work, and saves battery life. The touchscreen of the watch has a dual-layer display structure that features superimposed monochrome and color LCDs. 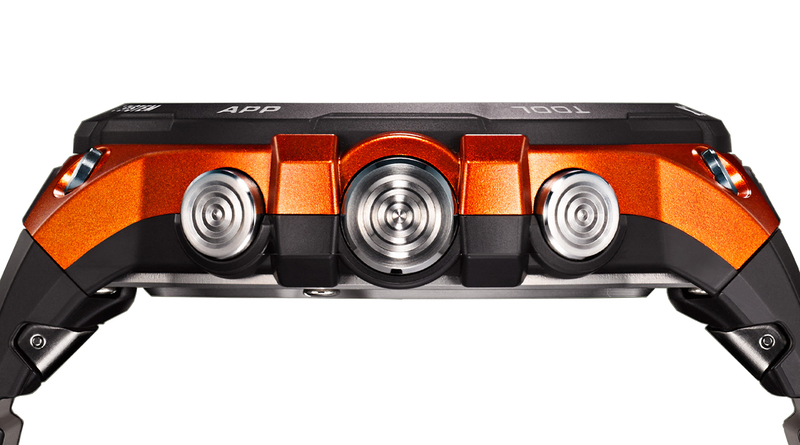 Monochrome for the time and measurement data, saving power and offering a clear view in direct daylight, and color for applications. Casio has a partnership with Mapbox, a provider of worldwide map data. Casio mentions you can download ‘your destination region in advance and select color area maps to use offline when you arrive’. 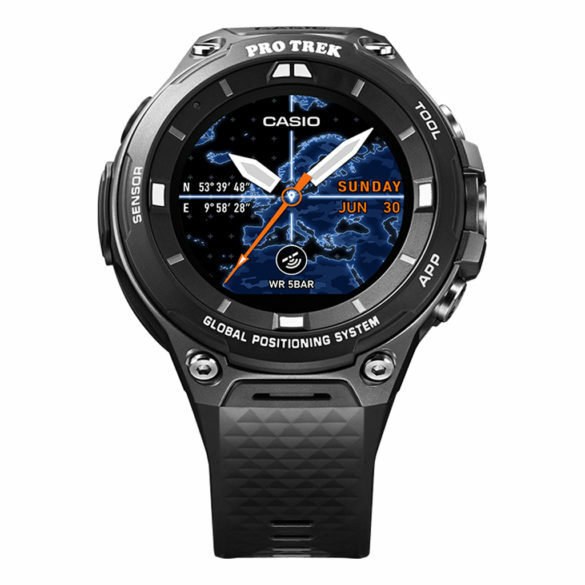 The built-in GPS function ensures displaying your position when you are offline. It is not clear how many maps you can download, and whether these are saved on the watch. Neither it is clear how much memory the watch has. The map functions enable you to record your track, to write memos on the map, the save voice messages and more. And you can choose from a variety of map lay-outs, from 3D maps and satellite view to detailed street maps. Don’t be afraid when things are getting a little rough. The watch meets the environmental-resistance standards prescribed by the MIL-STD-810G durability test established by the U.S. Department of Defense. So, it will work when you have dropped it, when it had heavy shocks or when you go under water. Perfect for outdoor activities like trekking, cycling, fishing, winter sports, and water sports. 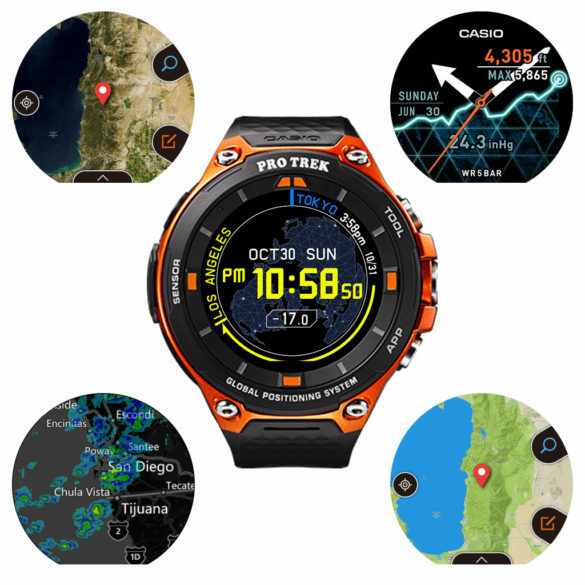 Some of the key functions, in some cases with an app: compass, altimeter, barometer, chronograph, navigation, world times, scheduling, activity tracking and text messaging. Take a few days to read the instruction manual to find out all its options. The release date of the Casio Pro Trek Smart WSD-F20 is 21 April 2017 and it comes in two colors: orange or black. And it’s big, even bigger than the Casio G-Shock MR-G GPS Hybrid: this one measures 61.7 x 56.4 millimeters. To get an impression of this time piece watch the video below.